Definition - What does Ardha Uttanasana mean? Ardha uttanasana is a standing forward fold that relaxes and restores the body and mind. In spiritual practice, this pose stimulates the third eye chakra and opens the heart. In this asana, the practitioner folds forward at the hips from a standing position, then lifts the head and heart, gently pressing them outward. To increase the heart-opening benefits of this asana, it can be practiced with the hands on a wall. The name for ardha uttanasana comes from the Sanskrit roots ardha, meaning "half," uttana, meaning "intense stretch," and asana, meaning "pose." This asana is called standing half forward bend in English. 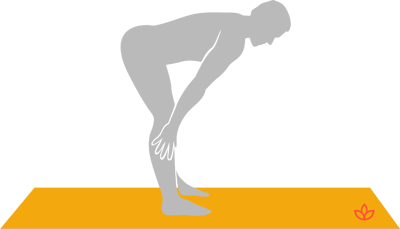 Ardha uttanasana is included in Surya Namaskara (Sun Salutation) sequences. It immediately follows uttanasana (forward fold), and lifts the upper body in preparation for stepping back into the rest of the sequence. Like many forward bends, ardha uttanasana is said to restore and rejuvenate the body, in addition to calming the brain. It has a wide range of therapeutic benefits and it is a good asana for reducing stress, anxiety and depression. Ardha uttanasana is associated with the ajna (third eye) chakra. It is said that the posture creates pressure or stimulation in the area of the third eye, which improves mental function and intuition. In the Iyengar yoga tradition, this asana is practiced with the weight of the body on blocks, then as the practitioner advances, the height of the blocks can be gradually reduced. It is considered a good preparatory posture for many other forward bends as well.